entleman, not even here am I safe from this continual chatter about bears. I am getting so I cant  oops, I almost made that horrible pun which has been following me about. To begin, the whole thing is a damned lie. I did not make love to the bear and the bear did not die of longing. Further, I do not make a practice of going around picking on poor, innocent Kodiak bears. The day I arrived in New York City, this thing began: I picked up my phone to hear a cooing voice say, "Capn do you like to wrestle with bears?" And since that day I have had no peace. How the story arrived ahead of me I do not know. Personally I tried hard to keep it a dark  I mean the whole thing is a damned lie! A man can spend endless months of hardship and heroic privation in checking coast pilots; he can squeeze his head to half its width between earphones calculating radio errors; he can brace storm and sudden death in all its most horrible forms in an attempt to increase mans knowledge, and what happens? Is he a hero? Do people look upon his salt-encrusted and exhausted self with awe? Do universities give him degrees and governments commissions? NO! They all look at him with a giggle and ask him if he likes to wrassle with bears. Its an outrage! Its enough to make a man take up paper-doll cutting! Gratitude, bah! Attention and notoriety have centered upon one singular accident  an exaggerated untruth  and the gigantic benefits to the human race are all forgotten! Gentlemen, examine the facts. A Kodiak bear, known in Alaska as the "brownie," is the worlds largest carnivorous animal. He stands as tall as two of us and weighs sixteen hundred active and ferocious pounds. This past autumn in two different parts of Alaska men were attacked by brownies and so badly mauled that one man died and the other will never walk again. And yet you imply that a sane man likes to wrassle with Kodiak bears! Why, compared with a Kodiak, a grizzly is a Teddy bear! No, the whole thing is preposterous and I must ask to be excused. You say that the rumors still persist and insist that there must be something behind them? Well  there was such an incident as the one you vaguely mention. But I tell you I had nothing whatever to do with it! The thing began when a trolling-boat skipper came up alongside a survey  came up alongside a big cutter and asked an officer if he wanted to run up through a passageway generally too shallow and too studded with rocks to admit a larger vessel. The officer, anticipating nothing, gladly went aboard the small trolling vessel and they shoved off. The boat was about 31 feet long and, because there were only a few pounds of fish in the hold, was somewhat subject to an unstable movement even though the day was calm. The boat chug-chugged between the steep shores of the winding channel and the officer admired the scenery considerably. However, the whole thing was a bit boring, for there is such a thing as too much scenery, even in Alaska. After some time the attention of the officer was attracted by a bobbing something out in the center of the wide channel. It might be a log or a seal but it was at least something of interest. As the troller approached, the outline of the head began to sharpen. Evidently it was a small black bear, trying stupidly to make headway against a two-knot current and stubbornly refusing to give up the struggle. The skipper bemoaned the fact that he had no gun aboard and the officer cursed the lack or forethought that had brought him here without a camera. "Ay vas thinking it vas a shame to lat the bear go," said the skipper. "Right you are," said the officer. "Isnt there some way we could get him?" "Maybe if we vent back and got a gun," suggested the skipper. "Its miles to the ship and hed be gone by then. Ill tell you, well drop a rope over his head and tow him back!" Nothing seemed simpler and the officer ran off a few fathoms of rope with a running bowline in it and the trolling boat soon overtook the swimming bear. It was easy to slip the noose over the animals head and make the other fall fast to the ship. This done, the fisherman turned on power and they began to tow the bear along at about four knots. The bear, however, objected. Water kept getting in his eyes and mouth and the rope around his neck was choking him. Probably he would have gone on having a hard time of it if water in the gas had not made the engine conk. The fisherman leaped down from wheel to engine and the officer took the helm to guide the boat with what way it had left. No attention was given to the bear for several seconds. Suddenly the boat reeled under the impact of a terrific blow. The three top gunwale strakes on the starboard side caved in like laths. The boat gave a terrible lurch and several hundred gallons of eager water spewed into the hull. The officer whirled, to see that their tow was coming aboard! Somehow it had come close to the boat and had clawed up the low side! 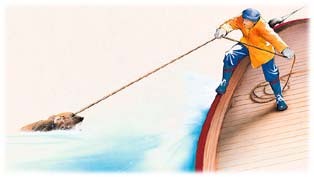 The fisherman leaped into the pilot house from below and the officer leaped for the deck, with some vague idea of shoving the bear back into the water with an oar.